There has been a lot of chatter about Katniss herself among Christian viewers (and readers). In the first film, she volunteers to take the place of her sister in the Hunger Games, a battle to the death between 24 "Tributes" from 12 post-American districts ruled by the Capital, a gaudy, totalitarian consumer state. Contestants are chosen by draft, and when Katniss's young sister Prim is chosen, she volunteers to go herself and take Prim's place. Once in the arena, she is directly responsible for killing three people, though in each case there's some measure of self-defense involved. 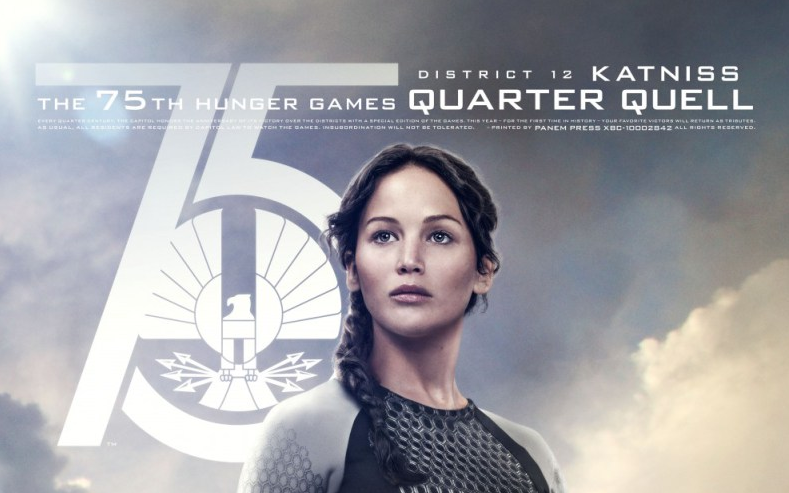 In the end, it comes down to her and Peeta, the love-struck male tribute from her home district. Rather than battle each other, they choose to commit suicide, but the games abruptly end, and they are both named victors. All of this is broadcast on live TV, and the nation is riveted. Their refusal to kill one another somehow ignites a furor in the other districts, and the powers see her as a problem. Her story presents a serious ethical crisis for viewers and readers. Is she a hero? Is she, as some Christians have supposed, a sacrificial Christ-figure who risks all, substitutes herself for Prim, and arises from certain death victorious? Or is she, as author N. D . Wilson argues, worthy of contempt for her participation in the games? Wilson makes an interesting case. He argues that to participate at all is to collude with the Capital. True defiance, he argues, would be to follow in the footsteps of Gladiator's Maximus, who refused to kill a fellow slave at the key moment the emperor demanded it and won the mob's allegiance as a result. But I'm not sure this counter example is "counter" at all. How many innocent slaves did Maximus eviscerate before that key moment? (In the "Are you not entertained?" scene alone, I count six—double Katniss's body count in the entire first film.) Clearly, Maximus chose to kill in order to survive. It's not until he gets to the Coliseum in Rome that he starts thinking about a cause greater than survival. Then, and only then, he refuses to kill. Actually, he kills a lot of people first, but at some point, he refuses to kill. Wilson thinks Collins "should have had Katniss cutting her locator out of her arm on night one instead of participating in and perpetuating the evil." He makes a case for a Katniss who deliberately defies the rules of the game, protects other tributes, and refuses to kill. It's a compelling idea, and perhaps Wilson should write that book; I'd want to read it. But I think Wilson misses the the big difference between a protagonist like Maximus and a protagonist like Katniss, and in so doing, misses what Collins's series is actually about. Maximus is a general of the Roman army, an experienced soldier, and a tactician both on and off the battlefield. He understands power and knows how to wield it. Katniss is far from it. At best, she's a scrappy, resourceful teenage girl who grew up in the poverty and oppression of a totalitarian state. The brilliance of Collins's books (and while we're at it, Lawrence's performance) is in how well she represents what a teenage girl would experience in these horrendous circumstances. The pinnacle of totalitarian control, as Hannah Arendt has argued, is in both the SS officer who operates a death camps and the prisoner who occupies it. Both are completely controlled by the state. This degree of oppression is hard to imagine from outside its walls, and therein lies Collins's strength. She presents us with an ordinary girl subjected to (and who participates in) state-sponsored terror because she can't imagine doing otherwise. She doesn't cut out her tracker because the state is watching, and they'll just drop into the arena and give her another one. They might give her a beating while they're at it. Or they might burn down her house and murder her family. The all-intrusive, all-encompassing grip of the state is the looming shadow in Katniss's life, and to defy that authority is to visit horror upon herself and everyone she cares about. That kind of paranoia is fundamental to totalitarianism, and Collins gives us a protagonist in the throes of it. I think if Isaac Asimov had written this trilogy, Katniss and Peeta would have completed their suicides. Denying anyone victory at the games would have been a more powerful political statement. Instead, Collins gives us a result that is less symbolically powerful, but more believable; given the opportunity to survive, the teenagers take it. It's far less an act of political defiance than an act of personal desperation. Catching Fire continues this theme. Katniss continues to choose to survive rather than run away. Her willful acts of rebellion are small: venturing into the woods to hunt for rabbits and stopping the flogging of a friend. And she's quickly frightened into obedience whenever the state flexes its muscle. The greater rebellious acts happen behind the scenes and without her knowledge. When she witnesses them on her "Victory Tour" for the Games, she's horrified. Here, too, she is the pawn of others, subjected to their desire for her as a symbol of open rebellion against the Capital. So we come back to the original question. Is she a hero? Though she isn't a substitutionary Christ figure, I think there's another type to consider when looking at her story (especially in the first two installments): the suffering servant. Consider The Lord of the Rings trilogy as a parallel: The Hunger Games doesn't give us an Aragorn, a warrior-king who rallies the forces of good. Instead, it gives us someone more complex and difficult, a girl who unwittingly becomes a symbol of national hope and rebellion, whose road is marked not by victory but suffering. She's not Aragorn; she's Frodo, a young, brave girl, carrying a burden in a political drama that is much bigger than her. Aragorn doesn't have nightmares about the enemies he's killed, but Frodo (and Katniss) never sleep well again. Her journey toward rebellion against the state isn't a triumphant march; it's a halting, faltering, struggle. Catching Fire is really a perfect title for this second film. The embers of rebellion glowing in the other districts are starting to spread, and though Katniss doesn't begin this story ready for war (she can't imagine it, as almost no child raised under totalitarian oppression could) she begins to catch fire herself. The Hunger Games trilogy reminds us that in some corners of the world, hope is improbable, unimaginable, but somehow, inevitable. Dehumanizing oppression is a power with an expiration date, and it has been throughout history. The human spirit (or the image of God in his creation) is too strong to stay crushed forever. It doesn't take much—a child, or a mockingjay—but once it appears, it's impossible to ignore.